My title for the day was “Gadget Girl.” I assisted the survey team by finding the bearing and horizontal distance to the feature in question. This trip is just so amazing! It blows my mind that I keep having more and more exciting days and great adventures! What if work really was like this?!?! These people have great jobs! Boats left at 6:30 this morning, but we were back just in time for lunch. ENS Jon French, survey technicians Stephanie Mills and Grant Froelich, and I boarded the Ambar 2302, which is a small open craft and headed to a location called The Haystacks and Whaleback: two interesting islands. We were doing shoreline survey, which is basically going in to verify or disprove what an airplane has already surveyed from above. This is called LIDAR (laser imaging detection and range). There are areas marked that might have a feature such as a rock that we have to check out and basically make sure it is there! I got to be gadget girl and when we found something, we had to log it by tracking it on a DGPS (differential global positioning system) satellite system, taking a picture, determining the bearing and finding the horizontal distance with a laser. The DGPS system is much more accurate than a standard GPS system. As the other survey techs manned the computer and DGPS system I had to quickly do the other three things. I had all three gadgets hanging from my neck and had to use them to give the techs the precise readings. Talk about nervous! 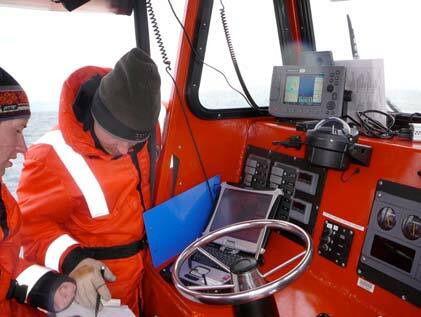 Jon and Stephanie work on the data from the cabin of the Ambar boat. 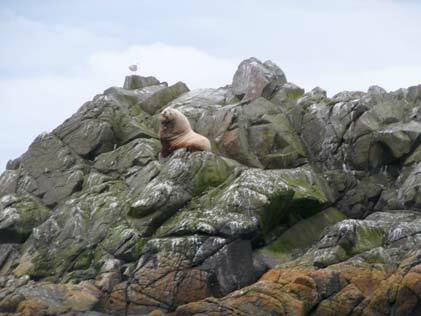 Stellar Sea Lions sun and play on Whaleback. I saw two bald eagles on the top of one of the Haystacks and two more on Whaleback. They were so pretty. I captured some short video of them flying. Video on the boat is a little tricky though as I learned today…too much up and down motion! Then I saw a cute little seal quickly scurry for the water as we scared him from his spot on the rocks and also a sea otter and one big behemoth sea lion! He barked and smiled at us as we passed. 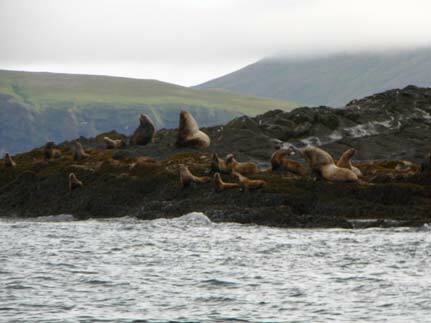 Then on Whaleback, which was a sea lions heaven, just a small short island that looked like the top of a whale’s back surfacing out of the water (hence the name), I saw about 40 more sea lions! They were noisy and smelly, but so cool. I watched them move like they were doing the worm. And they fought with each other and barked and splashed in the water. We watched them for 30 minutes as we were finishing our work, taking a break and snacking, before we headed back. On the way back, like I said, the waves were fierce. One behemoth sea lion smiles at us as we drive by! After getting lifted off the boat and getting nailed back down and slamming my back and tailbone! I decided to ride the rest out in the cabin. As I made my way back there Grant, my tour guide of spotting whales, pointed out some HUMPBACKS! Yippee. We idled and watched them surface and resurface. They were very, very far away, but looked so huge, so I can’t image what they would have looked like close up! They jumped so high and straight out of the water and splashed so hard back down. There might have been three or four! Soooooo awesome! So that was my day. Again, so amazing! I loved it! I then took a long hot shower when we returned, followed by a yummy lunch and a long nap! This stuff is tiring! Working over the summer and teachers just don’t go together! The tides determined our window for collecting shoreline data today. We were given the time window of 5:30 to 10:30 am. This is the time during the day when there is a negative tide. This makes it much easier for boats to see features in the water that would not normally be exposed during a high tide situation. The west coast experiences semidiurnal tides. This is different from the tides on the east coast, which are called diurnal. Can you describe the differences between the two types of tides? 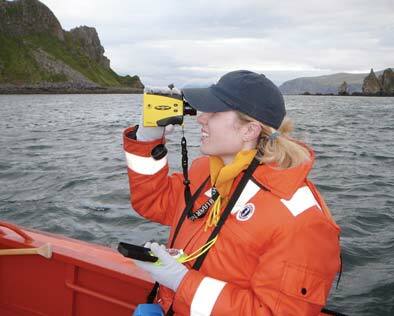 This entry was posted in 2006, Lisa Kercher, NOAA Ocean Service, NOAA Teacher at Sea and tagged Alaska, fisheries, humpback whales, Hydrographic survey, navigation, NOAA Ship Fairweather, sonar, steller sea lions. Bookmark the permalink.